Yr 12 Advanced English HSC Symposium (Seymour Centre) - All day till 5pm. At Patrician Brothers, we offer a quality Catholic education that supports every boy to achieve his personal best. Our College was founded in 1953 by the Patrician Brothers. 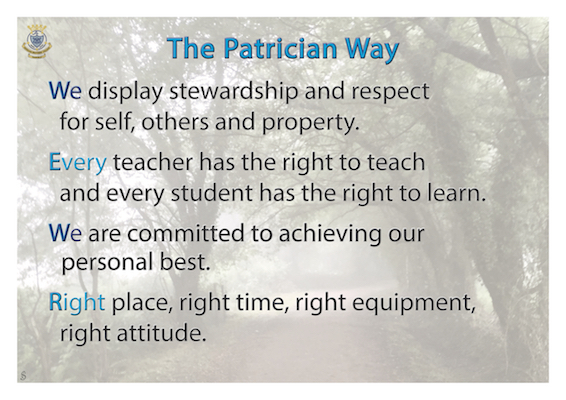 The charism of the Patricians is captured in our College prayer, the Breastplate of St Patrick. We are called to see the face of Christ in all whom we meet in our daily lives. Hospitality, welcome, education for all and outreach to the marginalised, are our four pillars. The College has flourished for over half a century with a strong spiritual, academic and sporting tradition. We have an impressive list of notable ex-students who have excelled in public, sporting and private life. Our academic and sporting success has sealed our present strong reputation, and has been extended into areas of Information Technology, Creative and Performing Arts, Debating, Public Speaking and Vocational Education. My hope for you is that this website will sew another thread into a tapestry that has already been tightly woven by the Patrician Brothers. Our Parents, Students, and Staff are people who have contributed so significantly in making Patrician Brothers’ College, Fairfield a special place of spirituality, learning, hospitality and welcome. We invite you to be part of our rich story.